The Mousetrap has celebrated going into its 60th year on stage with a gala performance featuring stars including Hugh Bonneville and Miranda Hart. The Agatha Christie play opened in the West End in 1952 and holds the record for the world's longest-running show. To mark the success of the production, a memorial celebrating novelist Christie has also been unveiled. Christie's grandson Mathew Prichard, was on hand for the unveiling and introduced the 25,000th performance. Mr Prichard was generously given the play's royalties for his ninth birthday by his grandmother. For the staging of the gala performance, Phyllida Lloyd, who directed the Mamma Mia film as well as many West End hits, brought together a host of famous faces. Among the cast brought together for the one-off show were Patrick Stewart, Julie Walters and Iain Glen. The eight actors had less than 24 hours to learn the play and memorise stage directions. "One of the tricky things is that there are so many entrances and exits and it operates pretty quick-fire," said Chariots of Fire star Nicholas Farrell, who played detective sergeant Trotter. Performed as a staged reading, meaning they were in costume but reading from scripts, the cast admitted to feeling nervous about taking on such an enormous task. Much of the success of The Mousetrap has been down to the collusion with audiences, who are asked to not reveal the culprit of the "whodunnit". Tamsin Greig, who took the role of Mrs Ralston, said she was most worried about dealing with props that could ruin the plot. "Can you imagine if I had put them in the wrong place, and not hidden them away?!" Downton Abbey star Hugh Bonneville said: "Tonight was the 25,000th performance and tomorrow will be the 25,000th professional performance, so that is pretty special. I'm very proud to be part of such a great legacy. I think she (Christie) has given work to all of us over the years." Many of the cast for the gala performance confessed to having never seen the play before. 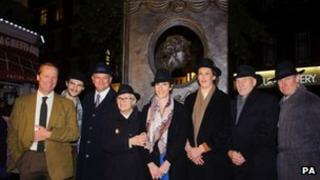 Sir Patrick Stewart said: "I came to see it last night for the first time, and I thought 'how has this passed me by'." The special performance also had a serious side as it was raising money for the Mousetrap Theatre Projects, which aims to open theatre up to disadvantaged young people and those with special needs. During its 60th year, tickets for The Mousetrap will levy an additional 60p fee which will go towards supporting the charity. Christie's grandson, Mr Prichard, will now also give over much of the royalties from the play to arts charities.